Svetlana Loboda (Светлана Лобода) has won the Ukrainian final with the song Be My Valentine. 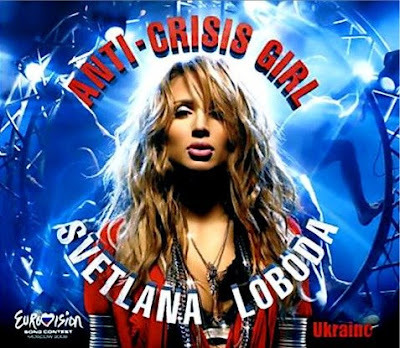 The new Eurovision version version is dubbed Anti Crisis Girl. A promo kit on Moon records includes a dvd with audio (mp3) tracks including the Eurovision entry and a remix. However the audio tracks are of a very low sound quality. The video's are perfect though. http://svetlanaloboda.com/ has the studioversion of the song. The album Anti Crisis Girl has the Eurovision version, Russian version and the remix. It also includes videos of Be My Valentine and the Russian version. The other tracks are previously released hits and favorites. The original performed version of Be My Valentine has not been available in a studio version. The new version has different lyrics tying in with the state of the world. Anti Crisis Bom, I wish I had thought of that. On the Anti Crisis Girl CD the remix is labeled 'Remix by DJ Maneken', but it's the same remix on the promo and the CD album. Promo DJ RU is a website where Russian DJ's show their wares. Currently the have 150 remixes of Be My Valentine. One rainy afternoon is not enough to listen to them all. Most can be downloaded (click the diskette). Let me know what the really great ones are. I haven't listened to them all but these are my favorites: Konstantin Yoodza Remix, Sister Jane Remix What are yours?